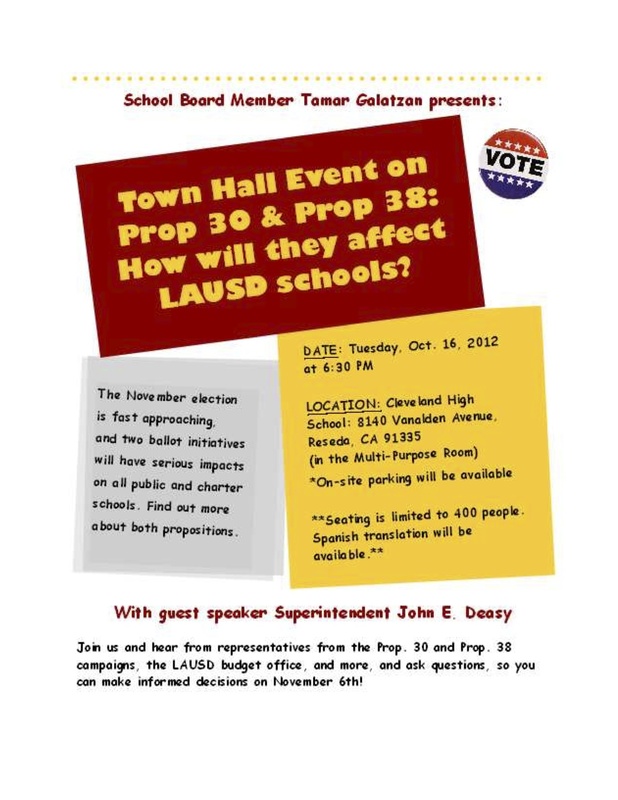 Los Angeles Unified School Board Member Tamar Galatzan cordially invites you to attend a Town Hall event on Prop 30 and Prop 38. On-site parking will be available. Town Hall will provide a venue where you may hear directly from Superintendant John E. Deasy, proposition experts, and ask your questions so you may be a well-informed voter. November elections are fast approaching and it’s very important to understand how the propositions will impact public education and students. Spanish translation will be available. Please see attached flyer for more details. This entry was posted in Announcements, LAUSD News and tagged budget, cuts to education, Education Funding, Prop 30, Prop 38, Supt. Deasy, Town Hall, Vote by gomama. Bookmark the permalink.